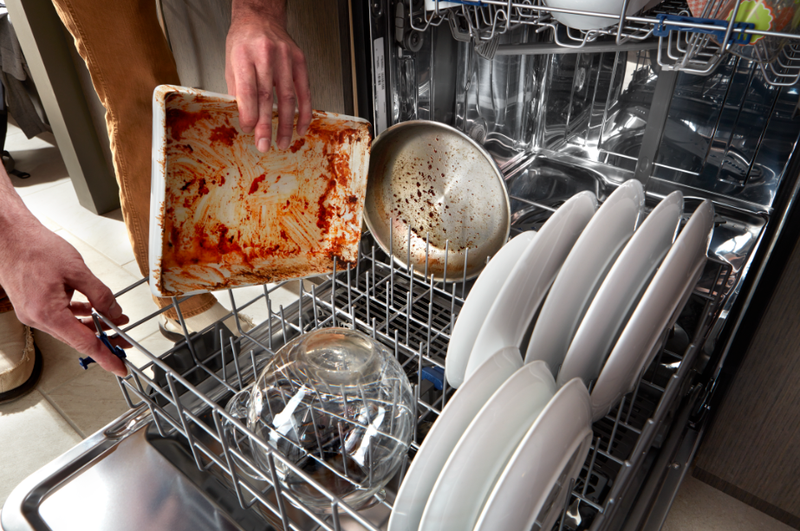 To rinse or not to rinse, that is the question… Whirlpool top 6 myth-busters for dishwasher etiquette! Loading cutlery – Knife blades are best stacked facing downwards and although there’s an ongoing dispute as to whether spoons and forks should follow suit! It’s really up to personal preference and makes very little difference. Alternating the bowls of spoons up and down to keep them from nesting together and not cleaning is an easy method, or you can mix the type of cutlery in the same sections to prevent poor cleaning results. Pre-rinsing – Is it really necessary? You may not realise, but this counteracts the water-saving benefits of the dishwasher and doesn’t let the it do its job! 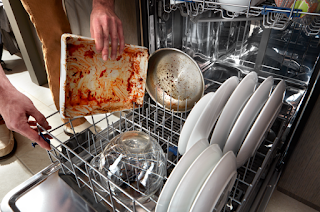 The only time dishes would need to be rinsed is if you were planning to keep the dishes in the dishwasher for several days before running or if there are excessive amounts of food residue on the plate, such as tomato sauces or strong curries and avocado seems to like to stick. Light residue means that the dishwasher detergent has something to work against! Glassware positioning – The upper rack of the dishwasher is designed to hold glassware and some models include features that reduce glassware damage, such as stemware holders. However, if the glassware can fit securely on the lower rack and it won’t roll around during the cycle, it’s allowed but not always recommended. Stacking dishes on an incline – This is important so that the water and detergent solution can spray up into the vessels. The ‘tipped’ loading will also help with drying but it’s important to ensure the incline used allows water to spray up as too steep an angle may not allow for a thorough clean. Stacking bigger items – Most dishwashers feature customisable space with removable top racks and adjustments, which will allow a row of tines on the bottom rack to lay flat. On occasions where you have large pots and pans to wash, it’s recommended the top rack be removed and bottom tines be laid flat, to make room for suitable stacking at the right angle. Setting the right cycle - Just as important as how dishes are stacked, most dishwasher models come pre-programmed with wash cycles that are suitable to different types of loads. If dishes are quite dirty, choose a more aggressive and longer running cycle at a high temperature option, which will cut through residue. It’s also important to use a top-rated multi-colour all-in-one detergent and quality rinse aid to help water sheet off the dishes. Combining these two will deliver the best cleaning performance and result in clean, dry dishes, plus most importantly, help save water and energy. Avoid unnecessary kitchen disputes with these top tips from appliance and consumer experts at Whirlpool Corporation for ongoing peace, exceptionally clean dishes and money saving solutions!